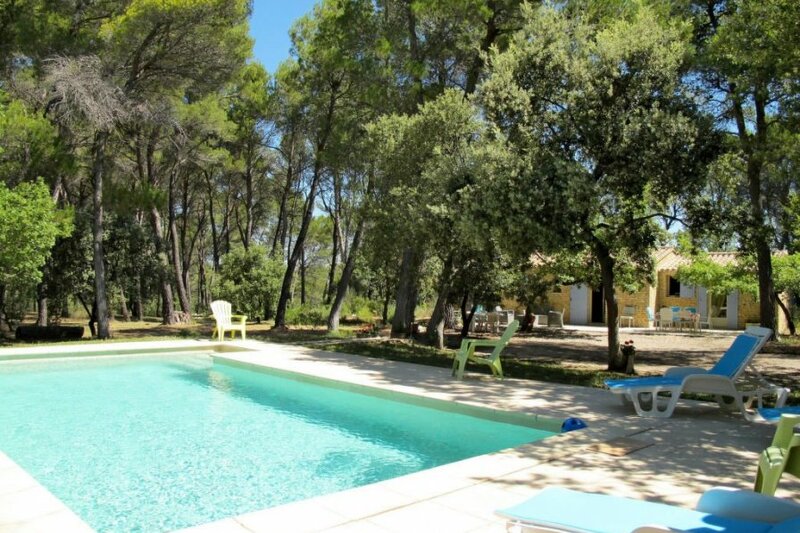 This 3 bedroom house with private pool is located in Pernes-les-Fontaines and sleeps 6 people. It has WiFi. Detached house, 6 people, 4 room/s, 3 bedroom/s, 2 bathroom/s, approximately 108 m², 1 floor/s, renovated 2010. Furnishing: pleasant, friendly, tiled floor. Equipment: TV; DVD, stereo; internet access Wi-Fi (included); washing machine; electric heating; storage room in the house. Electricity according to consumption approximately € 0.18/​kWh (100.00 kWh/​week included). Holiday resort tax. Linen/towels Bed linen available (beds are ready-made upon arrival). Towels must be brought along. Change of bed linen 1 x included for stays of 21 days and more. Deposit € 450 (in cash). Cot/​High chair free of charge (on order). Pet not allowed. Situation: detached position, rural, solitary. Access/parking: forest-track, approximately 150 m.
Estate (private use): approximately 2.8 ha, closed plot (fence, electric entrance gate), trees, natural surroundings, forest. Outdoor facilities(private use): terrace, furnishing provided (3 garden tables, 12 chairs), lounge furniture, flattop barbecue. Pool (private use): 9.0 x 4.5 m, 1.40 m deep, open throughout the entire season, secured by alarm system, pool maintenance by the owner 2 time(s) per week. Pool area: tiled, 4 sun loungers. The house is described as good value for money. It has a private pool and is located in Pernes-les-Fontaines. The nearest airport is only 26km away. It is set in a very convenient location, only 3km away from the city center. There is a trail for hiking nearby. The house is suitable for family friendly summer holidays; it is also suitable for elderly guests.